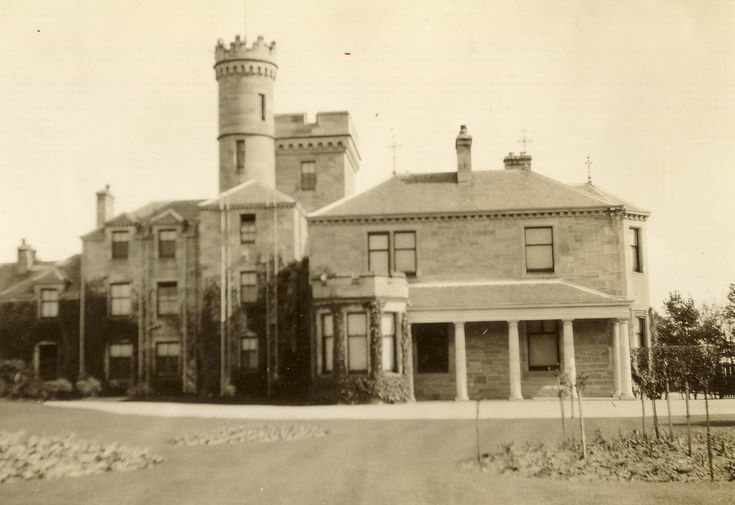 Dornoch Historylinks Image Library - "Barrow's Castle or Northfield now Burghfield"
"Barrow's Castle or Northfield now Burghfield"
Monochrome photograph with album notation "Barrow's Castle or Northfield now Burghfield" . (see also 2001_312_001_75 for a more distant view). From an album of postcards and photographs taken by Mrs J.I.C. Mackayand of Dornoch and surrounding area. Does anyone know why this was called Barrow's Castle? Is it possible that the Barrow family owned it? I would love any information about the house around 1904/5 as I think my grandparents worked there. "A rich London banker, Mr J.J. Barrow, built a mansion on the ridge overlooking the Cathedral ... and called it 'Northfield'. He brought his family, ... brought also fine roadster horses and at least two carriages, had stables built, gardens, shrubbery laid out, and trees planted. That considerable mansion is now the Burghfield Hotel, but while it was still Northfield it was purchased by Lord Rothermere."